Late check out (after 11:00 AM and before 12:30 PM) may result in a fee. Cancellation up to 8 days plus prior to arrival date will be free of charge. Cancellation 7 days prior to arrival date will be subject to the first night of accommodation charges. We are a small family Business and cancellations effect us greatly. All Cancellations without exception must be via email to reservations@doolinhostel.ie . A reservation is not deem accepted until confirmation via email from Doolin Hostel is received. WE DO NOT ACCEPT STAG HEN OR SIMILAR CELEBRATION PARTIES! We are not a party hostel, we live on site with our family and we love to cater for individuals, couples, families, small groups of adventures and explorers. We do accept certain groups with private accommodation and this is subject to availability, for group booking please contact us directly at reservations@doolinhostle.ie so we can look after you in the best way possible. Any modifications, cancellations or requests must come via email to reservations@doolinhostel.ie and are not deemed accepted until a response via email from Doolin Hostel is sent. Public Holiday and Festive Weekends and Groups of 8 plus require a 30% non refundable deposit. You will be notified of this charge via email if applicable to your booking and may be charged prior to email. But you will have the option to have it refunded if you wish to cancel the booking up to 72 hours of confirmation email being sent by us. These include Doolin Folk Festival in June, Irish Open in July, September Weekends. Groups of 8 or more may be subject to special conditions and the management reserves the right to administer these conditions at any time they see fit. We do not take Stag, Hen or similar Celebration Parties and regardless of deposit or payment management reserves the right to cancel at any time. Management reserves the right to refuse admission, regardless of deposits taken or full payment received. Reception is open from 8am to 9pm for inquiries. Check in is from 3pm - 9pm, we are a family run hostel and do not have a late night check in service. Early check ins are subject to availability, but we have luggage storage available and you are welcome to use the facilities. Check out is 11am, late check outs are subject to availability to 12.30pm and cost €5.00pp. We have luggage storage and you are welcome to use the facilities of the building if you are departing later in the day. We are a NON SMOKING building and do not tolerate smoking in bedrooms, if you wish to smoke in your room or out the window a €100.00 deep cleaning fee will be applied to your credit / debit card, we deem that if you smoke in your room you have automatically agreed to the fee. Children under 18 years of age must be accompanied by an adult and must stay in a private room. Under 18's are not permitted to stay in our dormitories. If you have special needs such as dietary requirements, allergies or have accessibility issues please let us know and we will do our best to assist. FREE Continental Breakfast buffet are included in all packages. Children under 4 when sharing bed / or babies using cot are Free. 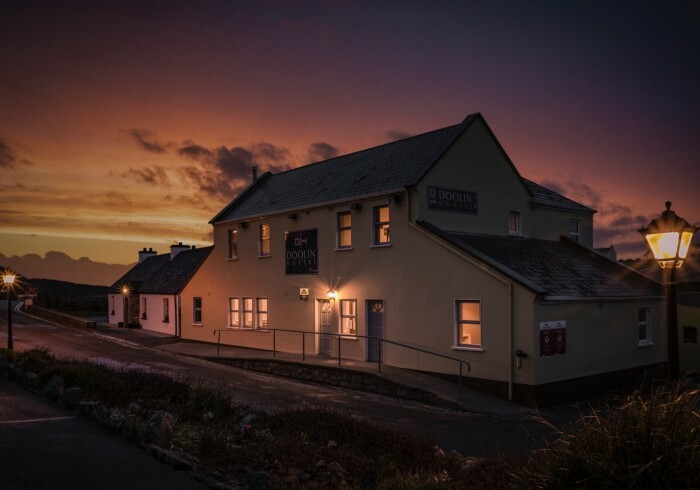 Doolin Hostel is a family run quality budget accommodation located in the center of Doolin at the bus stop, overlooking the village and out to sea. We are the start of the Cliffs of Moher Coastal walk and withing walking distance of all Irish Music Pubs, Aran Island Ferries and the Ideal place to explore the Burren, Doolin Cave, and North Clare. Doolin Inn & Hostel comprises of two buildings adjacent to each other. All rooms are tastefully decorated and come with newly renovated private bathrooms. All rooms have high quality Sleeptite bunk beds with individual LED lights, USB & Electrical Sockets, Lockers (locks not provided), linen and towel. Down stairs you have a full self catering kitchen, dining, living room with stove fire and drying room. We also have an area to wash down wetsuits and out door gear with a place to safety store them and hang them out to dry. Free WIFI is throughout and there is also a Computer and printer station. Free on site parking, Free Continental Breakfast Buffet are all included as standard. We look after families, adventurers and individual explorers and welcome all ages to come and share our hostel with us. We are not a party hostel and therefore do not cater for Stag, Hen or similar celebration groups. We love to cater for activity groups, colleges etc and have separate accommodation available, but additional terms and conditions apply and we can also cater for group meals and glad to help advise on group activities and professional local activity providers.